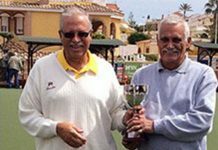 Back into the leagues following the break for the Spanish Nationals, first of all congratulations to all the Champions & finalists. South Alicante Spitfire League. 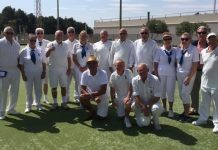 The Greenways were up against it at Quesada playing the Blenhiems, it’s always a going to be a hard nut to crack but we did manage to pick up fours points which was acceptable. Winning Triples were Lin Watkins, Bill Corbishley & Patrick Rafferty 17-12 and Del Gunning, Jeff Neve & Eric Bishop 15-14. Shots, VB 77(4) – 117(10) Q.
VCL. The start of the second half of this league saw another home derby between our two teams the Saxons and the Vikings. It was expected to be close and it couldn’t have been any closer than a draw! Ladies Singles, Sandra Burrows (S) 16 – 21 (V) Lin Watkins. Men’s Singles, Martin Foulcer (S) 21 – 13 (V) Barry Norris. Pairs, Del Gunning & Peter Whitehall (S) 17 – 12 (V) Frank Barclay & Gary Thorpe. 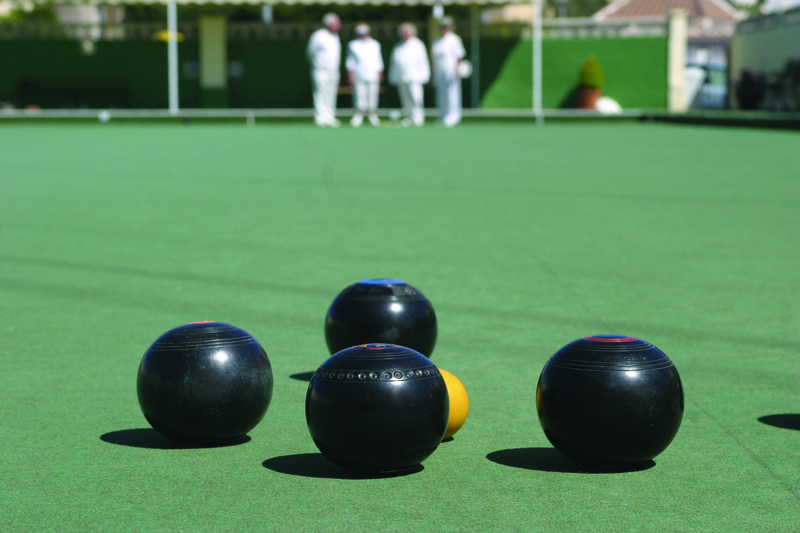 Triples, Neil Burrows, Steve Wilson & Arthur Brown (S) 14 – 15 (V) Ron Smith, Charlie Watkins & Carol Thorpe. Rinks, Irene Irwin, Mike Irwin, Jim Donnelly & Brian Dunn (S) 14 – 17 (V) Lynne Bishop, Jeff Neve, Bill Corbishley & Eric Bishop. Shots…Saxons 82(6) – 78 (6) Vikings. Men’s four wood pairs. The first game of the new season was drawn to play San Luis, our home pair of Eric Bishop & Arthur Brown finished with a draw of 17-17 and playing the away leg was Del Gunning & Peter Whitehall who won 17-14 so four points to Vistabella and one to San Luis. 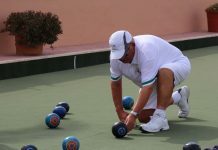 SAN LUIS BOWLS CLUB REPORT 01.06.18. Here we go again; all the leagues back to normal, summer seems to have arrived and we are all trying to find the shade! Our teams have made a good start so let’s hope we can keep it going to the end of the season. 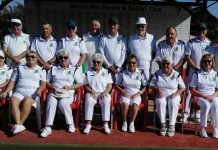 South Alicante Summer League: Monday 28th May SL Wellingtons home v SM Christians, had a great result, points12-2, 131 shots-78. 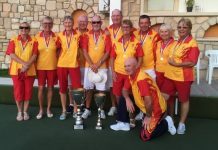 Winners: Kath Reid, Neil Morrison, Ian Kenyon 27-10, Helen Hammond, Derrick Cooper, Scott Malden 18-15, Margaret Morrison, Sabrina & Russell Marks 17-15, William Holtham, Sheila Cammack, Vic Slater 26-11, Bob White, Jo & Jules Pering, 31-9. 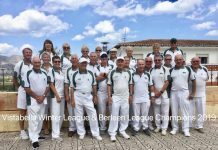 SL Hercules away v CB Badgers had a close result, points 8-6, shots 100-94. 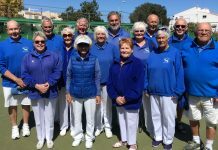 Winners: Mags Haines, Ralph Jones, Roy Cordell 29-9, Mario Cavilla, Ken Dullaway, Les Bedford 19-15, Audrey Ford, Terry Baylis, Charlie Marigold 18-7. 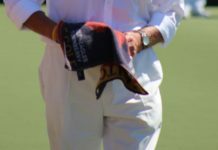 Wednesday 30th May VCL: SL Falcons home v EI Dukes, had a good result; points10-2, shots 105-80. 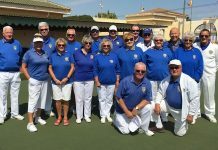 Winners: Singles – Kath Reid 21-15, Ian Kenyon 21-17, Pairs – Jan & Brian Pocock 32-17, Triples – Neil Morrison, June & Keith Jones 15-14. SL Hawks played an evening match away v SM Marshalls and had a close game, shots 77-72, points 8-4. Well done: Singles – Bill Webb 21-12, Pairs – Les Bedford & Charlie Marigold 16-10, Rinks – Sally Cordell, Caz Blay, Bob Bromley, Roy Cordell 14-11. In the South Alicante Hurricane Division The Gladiators were away to La Marina Pilots, Final score was Total shots for -103 against – 118. Points for – 4. against – 10. Winning rinks were — Jim McClean, Val Duchart, John Obrien. – 22 shots to 19. 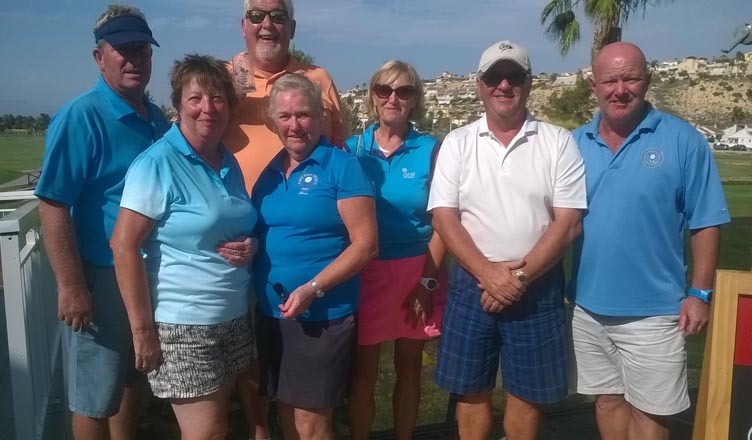 Jean Thompson, Phil Lockley, Chris Dewar, – 19 shots to 13. In The VCL The Jasmines were away to Horodada, After a shaky start most rinks worked hard to come back to level terms. So even though we only managed to win the one rink it was a great effort so well done. Final score then was – total shots for – 85. shots against – 114. Points for – 2. points against – 10. Mary Lockley was our only winner of the Ladies Singles, 21 shots to 20. 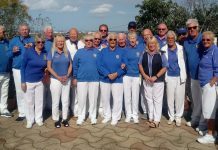 We have ,two teams in the La Siesta Open so good luck to Mel Mary and Phil and Janet Jean and Dave. Please visit our website for more information and for any inquires regarding becoming a member please telephone Haley on 966844399.